Join us online wherever you are. The LIVE Stream Package includes: high quality stream in English from all sessions in the plenary hall, participation in the direct messaging system during the Forum (questions and comments): Sli.do, downloadable participants list, priority access to the video material from the Forum. Click here to register for the pay LIVE Stream. 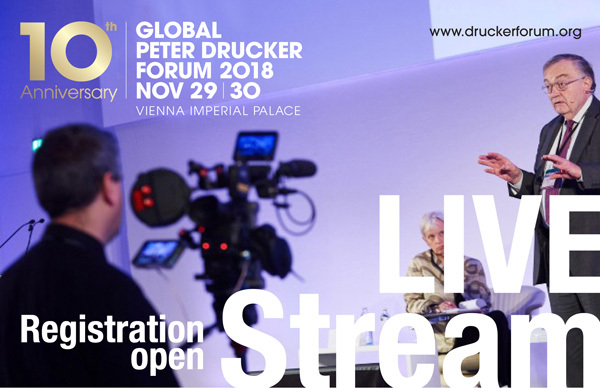 The Drucker Forum on November 29 & 30 is now fully booked, except for a limited number of places on November 30 (day 2) only. Please click here to register. First come, first served. There is still an opportunity to join prominent Forum speakers such as Linda Hill, Clayton Christensen, Rita McGrath, Alex Osterwalder, Vineet Nayar, Peter Oswald, Betsy Ziegler, Hermann Hauser, Georg Kopetz and Bill Fischer (conference chair) at the new Vienna Innovation Leadership Summit on November 28, 9:00 to 13:00 with subsequent networking lunch.